If you’ve been reading this blog for a while, then you know that I really have a hard time using a yarn that pools or flashes. So imagine my delight when I re-tried the yarn with a slightly smaller stitch count (52 sts) and a plain stockinette foot. 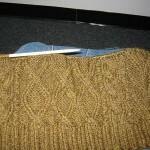 To compare the difference, here’s the old sock in the diagonal rib with a few extra sts. I think there were 60 sts in the sock ( the stitch pattern made for a smaller sock). The pooling was just about as much as I could handle. But this? This is behaving like Koigu, with its short color changes. I’m not getting overly confident though — I know this could change at any moment. Debi asked in the comments which cast on I used. I’ve been using Judy’s Magic Cast-On since the article came out this past spring. I’ve tried lots of different cast-ons: provisional for a short row toe, figure 8, the rectangle method (don’t know what that’s called), Turkish, and a few others that aren’t coming to mind. I first tried knitting socks on DPNs. I preferred the short row toe then, because the other methods were a lot harder for me to execute with the DPNs. Once I switched to circs, I quickly became a fan of the Figure 8. 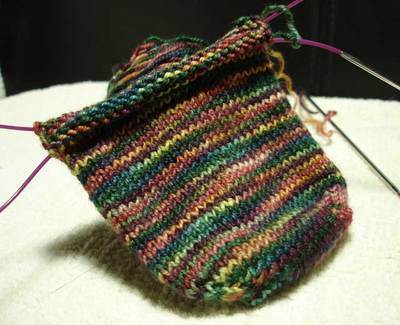 It was quick, and after knitting the toe it was easy to go back and tighten it up. 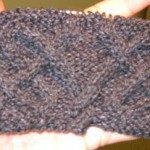 When Meg Swanson’s article came out in last fall’s Vogue Knitting, I gave the Turkish cast on a try. I know a lot of toe-up knitters like it, but it didn’t seem as smooth to me as the Figure 8. Everyone knits differently though, so don’t discount that cast-on because of me. I think I’m in the minority. If you’re curious how to do the Turkish cast-on, Debi did a great tutorial for it. So, back to Judy’s magic cast-on. It’s become my favorite because (like the Figure 8) it’s not fiddly, and (unlike the Figure 8) you don’t have to go back and tighten anything up. It’s as tight as it should be from the very beginning. I’m like you… pooling makes me batty!! I love the magic cast-on too. I did most of my toe-ups with the crochet provisional, and while I’m glad I know it (I just used it last night for a sweater with a turned hem), I am always looking for ways to avoid the hook. The simple stockinette looks good. It that STR lightweight? I’m a huge fan of the magic cast on also with magic loop – double magic! 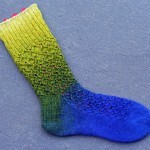 The socks look great – I love when yarn behaves! 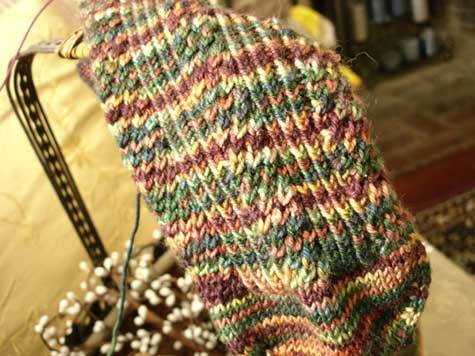 I’m working on the Claudia’s socks toe-up and used Judy’s magic cast on and loved it. The yarn is fabulous! thanks for sharing that link! i’m interested in trying toe-up socks for my next pair. what method of increasing do you use after casting on your stitches? and wow, 52 stitches for a sock! that seems small but maybe you are using needles larger than US1? 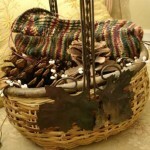 Looks great… I have had my own battles with pooling lately, I ended up changing projects completely! I’m with you on the pooling and flashing. 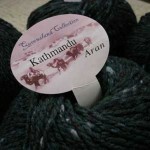 It makes me wonder why more people aren’t wary of variagated yarn. Oh yay- no pooling! I am knitting some socks and it didn’t pool until the reinforced heel. It is driving me nuts. I love the Turkish cast-on but I do need to go back and tighten it afterwards. Maybe I will give your fav a try! I agree with your cast-on choice. Judy’s is the best. She’s got a great blog too!! Hmm, skimming through Judy’s Magic Cast On gave me an idea on resolving the one thing I don’t like about the cast on I use – thanks for the link! ruKmzO acomplia rimonabant overnight This and other metabolites are later excreted in urine as glucuronides. 3LXJtQ does generic acomplia exist The inhibition of phosphodiesterase type 5 (PDE5) enhances erectile function by increasing the amount of cGMP. 9youuq acomplia acetylcholine Shortly after market introduction, press reports and independent studies suggest that side-effects occur stronger and more commonly than shown by the manufacturer in their clinical studies. Hello! dfackea interesting dfackea site!